Iron ore is the main source of primary iron required for the global iron and steel industries. 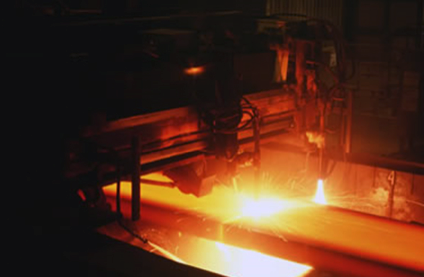 It is essential to produce steel, which helps to create and maintain a strong industrial base. Iron ore mining methods vary by the type of ore being mined. There are four main types of iron ore deposits worked currently, depending on the mineralogy and geology of the ore deposits. These are magnetite, titanomagnetite, massive hematite and pisolitic ironstone deposits. The Earth’s most important iron ore deposits are found in sedimentary rocks. They formed from chemical reactions that combined iron and oxygen in marine and fresh waters. The two most important minerals in these deposits are iron oxides: hematite (Fe2O3) and magnetite (Fe3O4). These iron ores have been mined to produce almost every iron and steel object that we use today – from paper clips to automobiles to the steel beams in skyscrapers. Ores containing very high quantities of hematite or magnetite (greater than ~60% iron) are known as “natural ore” or “direct shipping ore”, meaning they can be fed directly into iron-making blast furnaces. Iron ores are rocks from which metallic iron can be economically extracted. These rocks are usually found in the form of hematite (Fe2O3) or magnetite (Fe3O4). About 98% of world iron ore production is used to make iron in the form of steel. Nearly all of Earth’s major iron ore deposits are in rocks that formed over 1.8 billion years ago. At that time Earth’s oceans contained abundant dissolved iron and almost no dissolved oxygen. The iron ore deposits began forming when the first organisms capable of photosynthesis began releasing oxygen into the waters. This oxygen immediately combined with the abundant dissolved iron to produce hematite or magnetite. These minerals deposited on the sea floor in great abundance, forming what are now known as the “banded iron formations.” The rocks are “banded” because the iron minerals deposited in alternating bands with silica and sometimes shale. The banding might have resulted from seasonal changes in organism activity. The extraction of iron ore is generally performed through a blasting and removal process from large open pit mines, before it is crushed, screened and blended for export or local consumption. Once blended, iron ore is smelted and alloyed with metals (nickel, chromium, manganese, vanadium, molybdenum or titanium), which can then go on to produce different types of steel. Although iron in cast form has many specific uses (e.g. pipes, fittings, engine blocks) its main use is to make steel. Steel is the most useful metal known being used 20 times more than all other metals put together. Steel is strong, durable and extremely versatile. The many different kinds of steel consist almost entirely of iron with the addition of small amounts of carbon (usually less than 1%) and of other metals to form different alloys (e.g. stainless steel). Pure iron is quite soft, but adding a small amount of carbon makes it significantly harder and stronger. Most of the additional elements in steel are added deliberately in the steelmaking process (e.g. chromium, manganese, nickel, molybdenum). By changing the proportions of these additional elements, it is possible to make steels suitable for a great variety of uses. Steel’s desirable properties and its relatively low cost make it the main structural metal in engineering and building projects, accounting for about 90% of all metal used each year. About 60% of iron and steel products are used in transportation and construction, 20% in machinery manufacture, and most of the remainder in cans and containers, in the oil and gas industries, and in various appliances and other equipment. Steel Mill: Most iron ore is used to make steel. Here a steel slab is being cut to length in a steel mill. How is iron ore processed? Concentration includes all the processes that will increase (upgrade) the iron content of an ore by removing impurities. Beneficiation, a slightly broader term, includes these processes as well as those that make an ore more usable by improving its physical properties (e.g. pelletizing and sintering). Many of the iron ore mines employ some form of beneficiation to improve the grade and properties of their products. At many operating mines, ore processing facilities (OPF) have been constructed to enable beneficiation of low-grade iron ores, including ores which have been contaminated with shale, to be mined and, after upgrading, sold as high-grade products. The operation of the OPFs has also increased the iron ore resources available at these mines. Pelletizing is a treatment process used for very fine or powdery ores. Pellets are an ideal blast furnace feed because they are hard and of regular size and shape. Sintering is a process used to agglomerate iron ore fines in preparation for blast-furnace smelting and is usually carried out at iron and steelmaking centers. It involves the incorporation of crushed limestone, coke and other additives available from iron and steelmaking operations. These additives include wastes extracted from furnace exhaust gases, scale produced during rolling mill operations, and coke fines produced during coke screening. Pig iron is an intermediate step in the production of steel and is produced by smelting iron ore (commonly in lump, pellet or sinter form) in blast furnaces. The removal, by oxidation, of impurities in pig iron such as silicon, phosphorus and sulfur and the reduction in the carbon content, results in the production of steel.